Scientists from the Spanish National Research Council have discovered a 4,000-year-old funerary garden- the first such garden ever to be found- on the Dra Abu el-Naga hill in Luxor, Egypt. Such gardens have been observed in images but this is the first time that physical evidence has been found. The shift from hunter-gatherers to agriculturalists is thought to have started around 12,000 years ago (Neolithic – New Stone Age). But I suspect that just 8,000 years for the development from intentional cultivation to purely decorative gardens may be an underestimate. Early farming by semi-nomadic tribes is probably much older than 12,000 years ago. Around the equator conditions were conducive for farming even during the glacial maximum. In fact there are suggestions that the roots of agriculture lie in the depths of the pre-Holocene glacial maximum. From the evidence of stones used to grind grains these beginnings lie at least 23,000 years ago. A period of some 20,000 years to go from cultivation for survival to decorative gardens seems more plausible to me. The Djehuty Project, led by research professor, José Manuel Galán, from the Spanish National Research Council (CSIC), has discovered a 4,000-year-old funerary garden- the first such garden ever to be found- on the Dra Abu el-Naga hill in Luxor, Egypt. The discovery comes during the 16th year of archaeological excavations which are sponsored this year by Técnicas Reunidas and Indra. “Digging in a necropolis not only allows us to discover details about the world of funerals, religious beliefs and funerary practices, it also helps us discover details about daily life, about society and about the physical environment, both plant and animal. The necropolis thus becomes, as the ancient Egyptians themselves believed, the best way to understand and embrace life,” concludes the CSIC researcher. The Baltic region developed agriculture before the large migrations of the bronze age. 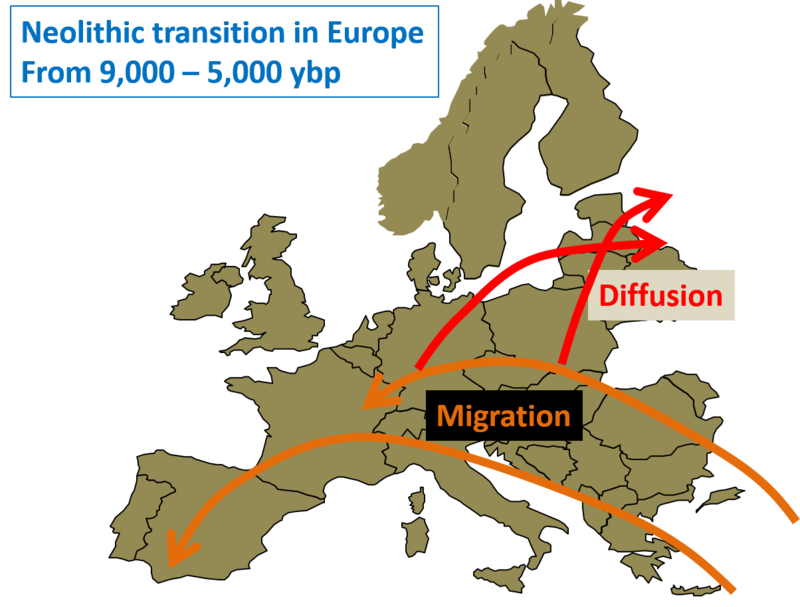 The Neolithic transition therefore was not only by migration (as in Southern Europe) but also by the diffusion of culture to hunter gatherers in the Baltic region. The Neolithic transition was a dynamic time in European prehistory of cultural, social, and technological change. Although this period has been well explored in central Europe using ancient nuclear DNA [ 1, 2 ], its genetic impact on northern and eastern parts of this continent has not been as extensively studied. To broaden our understanding of the Neolithic transition across Europe, we analyzed eight ancient genomes: six samples (four to ∼1- to 4-fold coverage) from a 3,500 year temporal transect (∼8,300–4,800 calibrated years before present) through the Baltic region dating from the Mesolithic to the Late Neolithic and two samples spanning the Mesolithic-Neolithic boundary from the Dnieper Rapids region of Ukraine. We find evidence that some hunter-gatherer ancestry persisted across the Neolithic transition in both regions. However, we also find signals consistent with influxes of non-local people, most likely from northern Eurasia and the Pontic Steppe. During the Late Neolithic, this Steppe-related impact coincides with the proposed emergence of Indo-European languages in the Baltic region [ 3, 4 ]. These influences are distinct from the early farmer admixture that transformed the genetic landscape of central Europe, suggesting that changes associated with the Neolithic package in the Baltic were not driven by the same Anatolian-sourced genetic exchange. New research indicates that Baltic hunter-gatherers were not swamped by migrations of early agriculturalists from the Middle East, as was the case for the rest of central and western Europe. Instead, these people probably acquired knowledge of farming and ceramics by sharing cultures and ideas — rather than genes — with outside communities. We know through previous research that large numbers of early farmers from the Levant (the Near East) — driven by the success of their technological innovations such as crops and pottery — had expanded to the peripheral parts of Europe by the end of the Neolithic and largely replaced hunter-gatherer populations. However, the new study, published in the journal Current Biology, shows that the Levantine farmers did not contribute to hunter-gatherers in the Baltic as they did in Central and Western Europe. The research team, which includes scientists from Trinity College Dublin, the University of Cambridge, and University College Dublin, says their findings instead suggest that the Baltic hunter-gatherers learned these skills through communication and cultural exchange with outsiders. The findings feed into debates around the ‘Neolithic package,’ — the cluster of technologies such as domesticated livestock, cultivated cereals and ceramics, which revolutionised human existence across Europe during the late Stone Age. Advances in ancient DNA work have revealed that this ‘package’ was spread through Central and Western Europe by migration and interbreeding: the Levant and later Anatolian farmers mixing with and essentially replacing the hunter-gatherers. But the new work suggests migration was not a ‘universal driver’ across Europe for this way of life. In the Baltic region, archaeology shows that the technologies of the ‘package’ did develop — albeit less rapidly — even though the analyses show that the genetics of these populations remained the same as those of the hunter-gatherers throughout the Neolithic. Sedimentary evidence from the Yellow River may have settled the chronological discrepancy between the historical and the archaeological chronology as to when Yu the Great introduced his ground-breaking (no pun intended) methods of flood control. For his accomplishments he was made King, and that in turn turned out to be the introduction of dynastic rule in China by starting what was to be the Xia dynasty which lasted just over 1,000 years. Wikipedia: Yu the Great (大禹 c. 2200 – 2100 BC) was a legendary ruler in ancient China famed for his introduction of flood control, inaugurating dynastic rule in China by founding the Xia Dynasty, and for his upright moral character. The earliest historical records of Yu start only about 1,000 years after his death. It was thought that Yu lived around 2,200 BCE. A new paper in Science reports on studies of Yellow River sediments and suggest that the cause of the flood was a landslide, caused by an earthquake, that planted a massive natural dam across the Yellow River where it travels through the Jishi Gorge after emerging from the Tibetan plateau. The dam would have risen some 800 feet above the river’s present level. Using stratigraphic data and radiocarbon dating, Wu et al. verify that the flood occurred and place the start of the Xia dynasty at about 1900 BC, thus reconciling the historical and archaeological chronologies. They present evidence for an enormous landslide dam break 1922 ± 28 BCE that coincided with the major cultural transition from the Late Neolithic to the Early Bronze Age in China and that also helps explain curious details of Yu’s story. Abstract: China’s historiographical traditions tell of the successful control of a Great Flood leading to the establishment of the Xia dynasty and the beginning of civilization. However, the historicity of the flood and Xia remain controversial. Here, we reconstruct an earthquake-induced landslide dam outburst flood on the Yellow River about 1920 BCE that ranks as one of the largest freshwater floods of the Holocene and could account for the Great Flood. This would place the beginning of Xia at ~1900 BCE, several centuries later than traditionally thought. This date coincides with the major transition from the Neolithic to Bronze Age in the Yellow River valley and supports hypotheses that the primary state-level society of the Erlitou culture is an archaeological manifestation of the Xia dynasty. But records of the first dynasty, that of the Xia, contain stories of a Great Flood with a Noah-like savior, the Emperor Yu, who gained the mandate of heaven after dredging canals to dispel the floodwaters and make the land safe. Historians have long wondered whether this flood account was a creation-style myth, the folk memory of a real event, or some mixture of the two. Some have dismissed the story of Emperor Yu as a fiction intended to justify centralized rule and, in the absence of any evidence of a massive flood at the time, many have regarded the stories of the Xia dynasty as more myth than history. A team of archaeologists and geologists led by Qinglong Wu of Peking University in Beijing has now discovered evidence of a massive flood that they say could be the Great Flood mentioned in the Chinese annals. …..
For six to nine months, Dr. Wu’s team estimates, the river ceased to flow as water accumulated in the new lake behind the dam. Then, as the water overtopped the dam’s crest, the dam rapidly gave way, releasing up to 3.8 cubic miles of water, one of the largest known floods in the last 10,000 years. The outburst flood wave could have traveled as far as 1,250 miles downstream, breaking the river’s natural banks, causing extensive flooding and even making the Yellow River switch course. Floods are often hard to date. But the same earthquake that dammed the river provided a date by destroying a village called Lajia some 16 miles downstream. Fissures caused by the earthquake are completely filled with sediment from the outburst flood, with no annual deposit of the windblown earth that is common in the region, which means the flood occurred the same year as the earthquake, Dr. Wu’s team says. Radiocarbon dating of the bones of three children killed by the earthquake establish that the event took place around 1920 B.C. It seems humans had twine and ropes some 40,000 years ago in the depths of the ice age. They used tools to twist plant material and vines to make rope. And while these would have been indispensable for hunter-gatherers, it also indicates that they must have had bases or “settlements” which they maintained for sufficiently long to bring their “technologies” into play. My image of hunter-gatherers is one where clans and tribes were mobile but spent weeks together at beneficial “bases”. Possibly the beginnings of summer and winter camps. If they had rope and twine, they had thread. If they had thread, they probably had some form of garments. If they had twine, they had the “technology” for bows and arrows. If they had rope they would also have had the capability to drag heavy weights across primitive rollers. Speech and counting were also coming into play around 50,000 years ago. Wolves – or some of their less aggressive members – were probably “cooperating” with humans at around this time. In relative terms, the developments taking place some 50,000 years ago were probably as epoch-making as the changes in the 19th and 20th centuries. It has been generally thought that the Harappan Civilisation (the Indus Valley Civilisation or, more correctly, the Indus-Saraswati Valley Civilisation) lasted about 2,000 years from about 3,300 BCE to about 1,300 BCE with a peak period from about 2,600 BCE to about 1,600 BCE. It was known that settlements in region date back almost 9,000 years ago (7,000 BCE) but it was thought that these were small, isolated settlements and not part of a cohesive society. But a new paper reports on studies based on “a high resolution oxygen isotope (δ18O) record of animal teeth-bone phosphates from an archaeological trench itself at Bhirrana, NW India, preserving all cultural levels of this civilization. Bhirrana was part of a high concentration of settlements along the dried up mythical Vedic river valley ‘Saraswati’, an extension of Ghaggar river in the Thar desert. 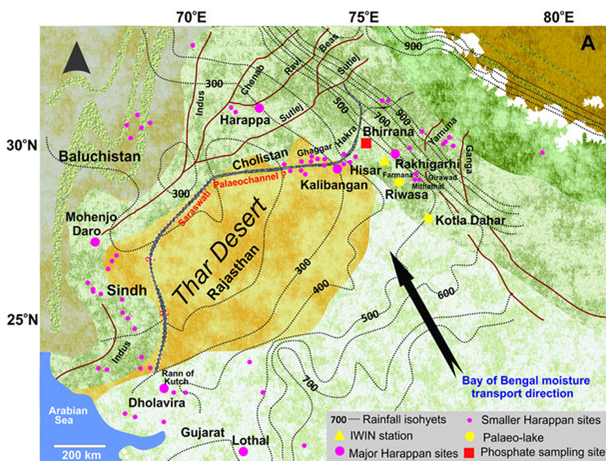 Isotope and archaeological data suggest that the pre-Harappans started inhabiting this area along the mighty Ghaggar-Hakra rivers fed by intensified monsoon from 9 to 7 ka BP. The monsoon monotonically declined after 7 ka yet the settlements continued to survive from early to mature Harappan time. Our study suggests that other cause like change in subsistence strategy by shifting crop patterns rather than climate change was responsible for Harappan collapse”. The “Harappan civilisation” lasted, it seems for 4 to 5 millenia, and climate was probably just one of many factors causing its decline. But the decline was nothing very sudden. It may well have been a gradual depopulation of the region as inhabitants moved east and south. Some may have moved back to the north-west as the Thar Desert established itself. What is striking is how the two great rivers, the Indus and the Saraswati (Ghaggar or Hakra), totally dominated the landscape. It is not surprising that an advanced water management “technology” developed. The growth of managed agriculture and trade followed. The period of intensified monsoon from 7,000 BCE to about 5,000 BCE could have been a time of plenty which promoted growth and settlement. What is still remarkable is that there is no evidence of war-like events. The decline was not due to an invasion or a war. But the society was structured and had many building standards and techniques which were applied across many of the towns. Some form of central administration – if not rule – must have been in place. It seems to be that the “settled”, peaceful society that seems to have existed may well have been due to the “invention” of professional guilds and the classification of people by function (and not primarily of hierarchy). Classification were perhaps established during the times of plenty. While it may have been a “horizontal” classification which was so successful, it was also the classification which lead eventually to the castes and the perversions of castes which are visible today. It is not impossible that it was societal pressures as a horizontal classification gave way to a vertical stratification which contributed to the decline. But that is all just my speculation. 500,000 years ago human ancestors were well on their way to becoming the dominant species on the planet. Human ancestors had rudimentary control of fire some 1.5 – 2 million years ago, and that was the single event that led to the inevitable journey to becoming the dominant species. But though fire made dominance inevitable, it was a slow process. A new paper shows that tooth marks on the bones of a 500,000 year old hominin were caused by a large carnivore and indicating that the hominin had been consumed. The carnivore must have been a hyena-like creature. During the Middle Pleistocene, early humans likely competed for space and resources with large carnivores, who occupied many of the same areas. However, to date, little evidence for direct interaction between them in this period has been found. The authors of the present study in PLOS ONE (open access) examined the shaft of a femur from the skeleton of a 500,000-year-old hominin, found in the Moroccan cave “Grotte à Hominidés” near Casablanca, Morocco, and found evidence of consumption by large carnivores. ……. ……. While the appearance of the marks indicated that they were most likely made by hyenas shortly after death, it was not possible to conclude whether the bone had been eaten as a result of predation on the hominin or had been scavenged soon after death. Nonetheless, this is the first evidence that humans were a resource for carnivores during the Middle Pleistocene in this part of Morocco, and contrasts with evidence from nearby sites that humans themselves hunted and ate carnivores. The authors suggest that depending on circumstances, hominins at this time could have both acted as hunter or scavenger, and been targeted as carrion or prey. I suspect that by 500,000 years ago human ancestors were not regular “prey” for carnivores but more of an opportunistic “find” for a cackle of hyenas. A fine map from Frontier Times showing pre Harappan sites, the Indus.Saraswati Valley sites and modern cities. The presumed course of the Ghaggar-Hakra must be close to the course of what was the Saraswati River. There is little doubt that some important coastal sites must now be submerged since the se levels were at least 10m lower than today during the peak of the civilisation. When settlements in the region started – perhaps 7,000 BCE – sea levels would have been 20 – 30m lower.